Enabling people to access data is one thing. But empowering them to do something intelligent with the data? 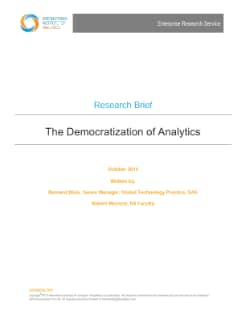 That’s democratization of analytics. No longer the exclusive province of statisticians and specialists, analytics is for all of us as we become more data-driven and analytical in our thinking and our work. This paper from the International Institute for Analytics summarizes key questions and answers about grass-roots analytics and the business opportunities and challenges that go with this phenomenon.